Spigen vs. Caseology Review: Which is the Better G3 Case? I don’t like having a case on my phone. In my experience, one has to sacrifice the phone’s slim design — one of the main features I look for in a mobile. It’s not that I don’t have accidents; I’ve dropped my phone multiple times in the past. I’ve accumulated my share of little dents, cracks and scratches, but a crack here and there never caused any problems with the phone’s normal function, so I just put up with a less than pristine device. However, a recent incident changed my perspective: my 3-week old LG G3’s screen developed a slight crack after it fell on the ground. From the impact, the right 20% of the touchscreen was no longer functioning properly any longer. Just like that a new $600 phone was now defective. When I bought my new G3 to replace the malfunctioning one, I began looking for a new case immediately; one that would not only protect my phone, but one that would also force me to sacrifice my fondness for a thin phone. I tested out two different G3 cases — one from Caseology and Spigen. 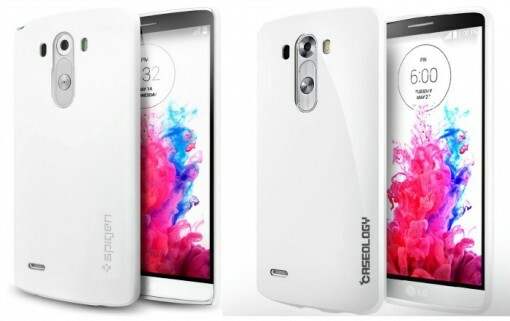 As you can see by the image above, both cases looked identical online, are similarly priced (Spigen $9.99 / Caseology $8.99), and came in white color. When I looked online for a case, I wanted to go with the Spigen case based off a friend’s recommendation. However Amazon was sold out of the case I wanted and I wasn’t sure when they would come back in stock. I surfed around some more and came across the very well-reviewed LG G3 slim fit cover from Caseology. The case boasts “Drop Protection” and “Shock Absorbent” with “TPU Bumper”. The reviews added up to about 4.5 stars, so I pulled the trigger. The Caseology phone case showed up a couple days later. When I first put the Caseology on my phone I was shocked at how much size it added to the phone – not just the overall heft but the cover also came up over the edges of the phone – great for protection but not great for those that like a phone on the slimmer size. Despite the initial red flags, I kept the case hopeful that I would get used to it. I used the case for over two weeks but I never quite got used to the size. The case bulked up the G3 to a point in which it felt like I had bought a different phone. On top of that, Caseology’s material didn’t feel cheap, but it didn’t feel expensive either. The material did make it easy to grip. Easy to hold obviously isn’t enough of a killer feature. Needless to say, I was passively looking for a new G3 case. A couple days later, I noticed that the Spigen case was back in stock at Amazon, so I ordered it. I was optimistic that the Spigen’s “Ultra Fit” cover would be more along what I expect from a thin protective case. As with the Caseology, the case arrived in a couple days. I slipped the Caseology off and snapped the Spigen case onto my G3. The case feels as if won’t protect the phone as much as the Caseology, but that’s just based off the slim profile of the Spigen. Not only did the case fit seamlessly, it added very little to the phone’s thickness. On top of being the better case, the Spigen also came with a 2 screen protectors! In the end, it wasn’t even a contest. With the Spigen case, it as if I have my G3 back again.